Whereas the turbulent years of the Early Modern Period were characterized by rather restricted and profane building activities, the period after the defeat of Turkish army in the Battle of Vienna in 1683 could be labelled as the triumphal comeback of religious topics into art, including architecture. This thematic focus was connected with the Recatholization and investments of the Catholic Church into the construction of new churches and monastery complexes, where educational institutions such as schools, collegiums or universities played an integral part. Jesuits, Piarists and Franciscans were among the most active builders in the Slovak territory, but many important constructions were built by other monastic orders as well. 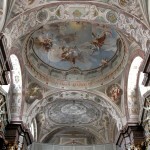 The Slovak territory was influenced by Baroque architecture’s impressive layouts and abundant use of various ornaments directly from the most significant centres such as Rome and Vienna. 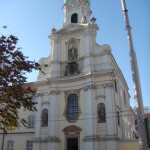 One of the first works that brought the new concept of church layout based on the principles of the Council of Trent was the St. John the Baptist Cathedral (1629 – 1637) in Trnava. It was here where they first executed the layout with a spacious longitudinal hall vaulted by barrel vault with lunettes and a series of side chapels above which there were located circle-head windows providing daylight to the cathedral. The Jesuit Church of the Gesù in Rome where the hall concept with a bland transept was first realized could be considered to be the model of this layout. However, in the course of Trnava Cathedral’s construction the builders responded to the local context and local traditions and they completely abandoned the idea of a transept. The front facade of the cathedral also differs from its Roman model by two side towers that extended the basic gable wall with its tympanum. An almost identical solution was used in the construction of the Jesuit Church in Vienna (1627 – 1631). Therefore it is obvious that a direct link with the Viennese cultural environment was, after all, stronger than the more distant Italian examples. The modification of the interior, murals, sculptural decoration and of furniture was also a typical feature of the Baroque architecture. The Cathedral in Trnava was not an exception. Label mouldings, ornamental plaster as well as frescoes with motives regarding the life of St. John the Baptist underlined its layout and drew the attention of believers to the lavishly decorated high altar. The St. John the Baptist Cathedral in Trnava is considered to be the most important work of architecture in the Hungarian Kingdom during Recatholization and it served as a model example for the construction of many other churches in our country. The cathedral is also labelled the “University Cathedral”. The reason is that shortly after it was finished, the Jesuits with the support of archbishop Péter Pázmány founded a university in Trnava, which has been in the city for more than 100 years. The general building boom in Trnava was connected to the construction of this university. Many churches and monasteries emerged, but especially the execution of the whole complex of buildings in the immediate neighbourhood of the university cathedral was the most important activity. The area of the university consisted of several mutually connected buildings – the collegium, grammar school, seminaries and convents. It dominates the urban structure in the historical core of the town to this day by its sheer monumental scale. A similar complex consisting of a collegium and university church was built in Košice after the establishment of the local university several hundred years later. The architectural layout and even the decoration of the Church of the Holy Trinity (1671 – 1684) as well as the planed structure of the whole area responds to the model example in Trnava and represents one of the first influences of Baroque Jesuitical architecture in the eastern Slovak territory. A part of the Counter-Reformation missionaries’ activity of Jesuits or Piarists was to establish a connection of liturgy with education. This connection can be seen in the construction of those monastery complexes that included schools. But they could also include hospitals or other various social institutions. These buildings were typically arranged into regular right-angled blocks with indoor courtyard and with orthogonal system of hallways. But they could also be positioned in the structure of the town. We can find such buildings mainly at squares or at crossroads of significant communications where they occupy the area of a whole town block, or rather its majority. There are many valuable architectural works such as the St. Francis Xavier Church with a Jesuit collegium in Trenčín (1653 – 1662), the large building complex of the Piarist monastery with a church, collegium, convent and school buildings in Nitra (1701 – 1742) or the Minor Basilica of the Virgin Mary of Seven Grievances in Šaštín-Stráže with a monastery complex Paulínov (1733), for which Franz Anton Hillebrandt – chief architect of Hungarian Cabinet of that period – designed the high altar made out of red marble. It was this important Viennese architect who is also considered to be the author of the reconstruction of Bratislava Castle and of the royal granary during the reign of Maria Theresa and also participated in the reconstruction of various palaces in Bratislava. Another famous architect participating in the propagation of the Italo-Austrian Baroque style in the Slovak territory was Franz Anton Pilgram (1699 – 1761). His activities are closely connected to Imre Esterházy – the archbishop of Esztergom – who invited Pilgram to Bratislava. Pilgram designed several buildings and monastery complexes in the then coronation city. The most important of them was the Church of St. Elizabeth (the monastery of Alžbetínky – an order of nuns) designed as a richly decorated one-nave space; facade with a dynamically warped moulding and a tower located in the centre. The Baroque reconstruction of St Emeram’s Cathedral in Nitra realized by Pilgram in the 1850s is also of exceptional artistic value. However, his major work in the Slovak territory was definitely the construction of the St. John the Baptist Church and the Premonstratensian monastery in a small eastern Slovak town called Jasov (1750 – 1766). It was a local provost – Andrej Sauberer – who commissioned Pilgram to build this large complex. Sauberer therefore contributed to the radical uplifting of this place not only in the material but also in the spiritual sense of the word. Pilgram designed the new complex as a symmetrical composition with two right-angled courtyards (convent and prelacy) by the sides of the centrally situated single-nave church. The building was extended with a large monastery garden designed as a regular geometrical shape typical of the French baroque. In lavishly decorated church interior and facade, Pilgram applied features of the dynamic baroque – castellated entablement, convexly curved bay and dome mural creating an illusion of ceiling open to heaven. The monastery in Jasov is a unique example of the applied monastery complex model in the territory of Hungarian Kingdom and also remarkable proof of the radical Austrian baroque influence in Slovak territory. We can find similar influence of the dynamical Austrian baroque in the Church of the Holy Trinity in Bratislava, although in a lot smaller scale. The dynamically shaped central space is crowned by an elusive dome fresco and projects itself onto a convexly curved facade with two low towers. An inseparable part of the recatholicization process was emerging of the Catholic religious buildings into public space. The small-sized constructions, such as calvaries, wayside chapels, wayside shrines, plague columns and Marian columns significantly influenced wider peripheral and spatial relationship in towns and even the landscape architecture. This was connected with the perspectives brought by the Baroque creators. However, calvaries built on hillocks as a series of twelve Stations of Christ on his way to Golgotha, were not only impressive elements of landscape architecture, but also places of pilgrimage designed to authentically mediate one of the mysteries of the Catholic faith to common believers. Most of them were built in the 18th century and the most notable of them include calvary in Banská Štiavnica, calvaries in Prešov and in Košice.